Spoilers if you haven't caught last night's episode of Heroes Reborn, yet. Everyone still here? Alright, let's go! Heroes Reborn is basically at the halfway mark, and while the series started out strong in its first two episodes, the weeks since have been a letdown. Events have moved at a snail’s pace, it’s been difficult to care about any of the new characters, and like the original Heroes series, plot contrivances are rampant. Honestly, I was at the point where if last night’s episode was as disappointing as last week’s, I was going to jump ship. Fortunately, “Game Over” was a game changer for the series. While this doesn’t make up for all the missteps the drama has taken so far, things are moving in a more preferable direction, and this happened through a few deaths and the return of an old friend. 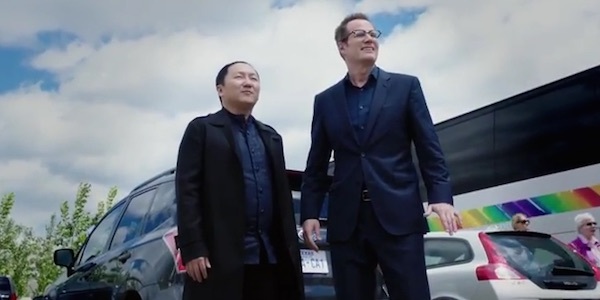 After interrogating Harris Prime at Erica Kravid’s mansion, Noah Bennet and Quentin Frady forced the cloning Evo to sneak them into the Renautas facility, where Hiro Nakamura was being held. Also heading to the same location were Miko, who had the Kensei sword back, and her friend Ren, who were going to save the Master of Time and Space, a.k.a. Hiro. Miko (who it turns out wasn't Hachrio Otomo’s daughter, but one of his “creations”) eventually crossed paths with Noah and Quentin, and after some convincing from Noah, agreed to work with them since their goal was the same. Unfortunately, they learned that Hiro was only accessible via the video game world Evernow, and in order to free him, Miko would have to sacrifice herself, which she did after defeating her dark doppelgänger. Meanwhile in the real world, Harris Prime escaped Noah’s custody and returned with reinforcements, including that Shadow Girl, who it turned out was Quentin’s sister. Quentin tried to snap his sister out of her funk, but after telling her that Erica gave her a purpose, she stuck her funky shadow tendrils through Quentin’s mouth. Noah managed to knock her out, but it was too late: Quentin was mortally wounded, but before he died, Noah lied and said that he successfully saved his sister. Making matters worse, Harris and his clones broke through the bulletproof doors seconds later, but right when Noah was about to be struck by a bullet, time stopped, and seconds later, Hiro (complete with way-too-long hair) rematerialized into the real world. The reunion between the two friends was brief, as Noah requested they head back in time to learn what really happened in Odessa. Heroes fans will remember that Hiro learned in the later episodes that “stepping on too many butterflies” in the past can irreversibly damage the present, but since Erica took his power and used it for her own purposes, he agreed and transported himself and Noah back to the day of the Odessa tragedy. There were other side plots in this episode, from Tommy teleporting to Paris with Emily to make sense of his destiny to “save the world” to former Evo hunter-turned-actual-Evo Luke and Evo wonder child Malina meeting because of "fate." However, none of these measured up to what happened in Noah and Miko’s storylines. We’ve seen “action” in previous Heroes Reborn episodes, but it’s always felt like filler. This time, the actions had meaningful consequences, and now it finally feels like the show is building up to something meaningful. To put it simply, the show has turned a new chapter. Sure, there’s still Erica’s sinister plan, the world in danger of being incinerated and the other side plots to deal with, but this was an important progression to something greater. Next week has Noah and Hiro back in time a year at Odessa, with Noah trying to find his daughter Claire and Hiro attempting to stop the bomb, which will see him fighting Harris Prime. The episode also features the return of Heroes alum Mohinder Suresh and Angela Petrelli. We know Molinder was blamed for the Odessa tragedy, so presumably we’ll learn what his actual connection to the event was, while Angela is discreetly meeting with him for an unknown reason. The show still has a lot of work to regain traction, and I’m still not sure if it’s possible to make up for all its early mistakes. However, if the show can keep this quality intact and improve upon its foundation, then maybe the latter half of Heroes Reborn can be salvaged into a good story. Heroes Reborn airs Thursdays at 8 p.m. EST on NBC.